THE "change the color of the clothes" IDEA CREDIT GOES TO KISEKIAEON! for i got the idea from her! SORRY AND THANK YOU! NOTE: YAY! BLUE AND TSUHOLIC! MY TWO FAVORITE THINGS TEHEHE. yeah i know that blue doesnt everybody there, but I LIKE BLUE! so PSH you. WELL hope you guys like this one too! bahhhhhhhhhhhhhhh im hungry! i shouldnt have stayed up all night. Now this one I like. I like the nice blue color and I love the font you used to write down the two titles and the swirlies around them are also very nice. This is really great! 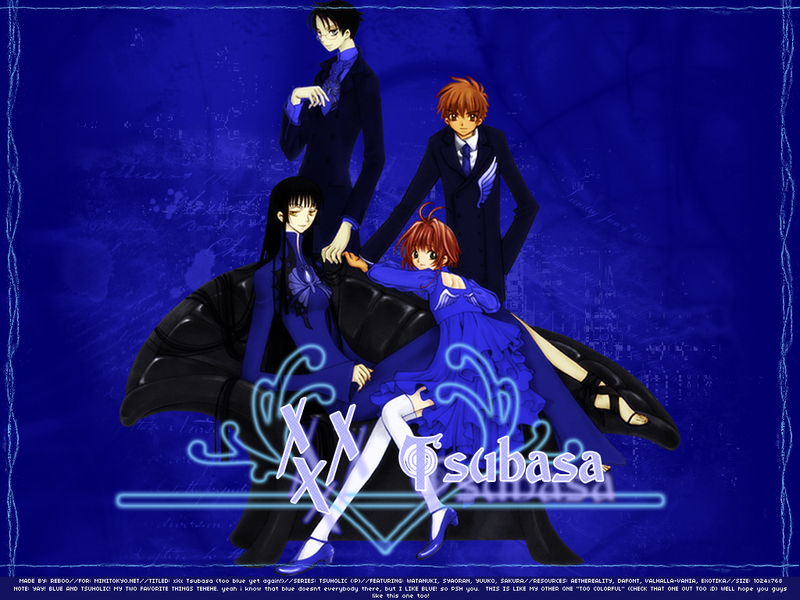 The blue is soft enough for Tsubasa but mysterious enough for Xxxholic! awesome! this picture is so great and cool!